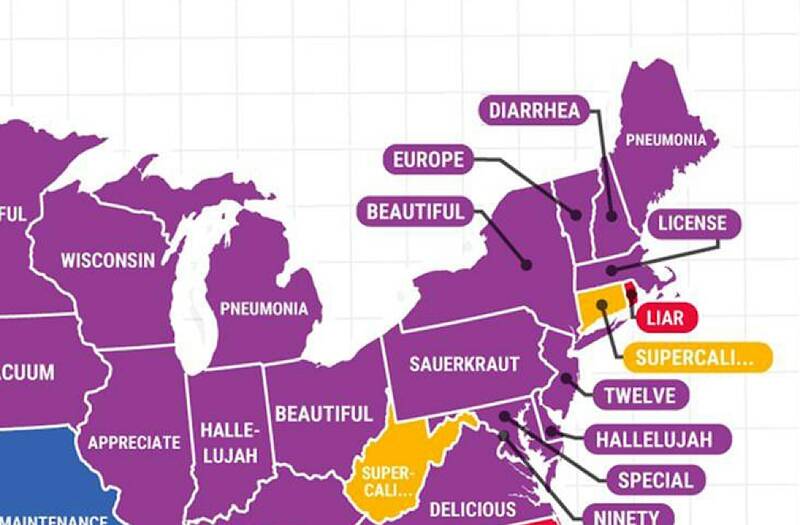 Just in time for the 2017 Scripps National Spelling Bee, Google released a new map revealing each U.S. state's most searched word for its spelling. And some people from Wisconsin have a lot to explain. The company honored the annual spelling bee by compiling a list of the most misspelled words in the country, which is categorized by how many letters were misspelled in each word. Apparently, residents in North Carolina had the most difficulty spelling "angel," while Wisconsinites had a tough time spelling their own state's name. The words listed ranged in difficulty from legitimate ones like "pneumonia" (Washington), "diarrhea" (New Hampshire), and "supercalifragilisticexpialidocious" (Virginia and Connecticut), to some as short as "banana" (New Mexico) and "gray" (Georgia). See how your state ranks in comparisons to others in our slideshow.